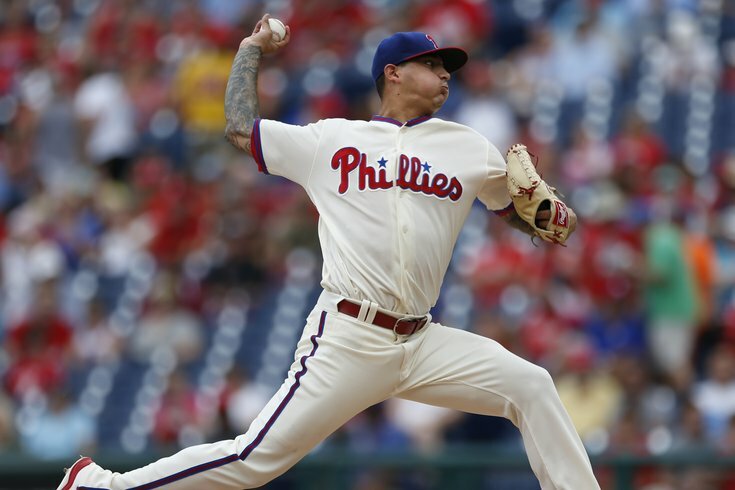 Vince Velasquez was scheduled to start on Tuesday night. Now he'll pitch Wednesday, a day prospect Nick Pivetta had been penciled in to make his MLB debut. If the Phillies have a save opportunity arise on Friday night at Citizens Bank Park against the Atlanta Braves, the ball will be in Hector Neris’ hands. This is what manager Pete Mackanin said on Friday afternoon, roughly 18 hours after plopping Neris in the ninth inning role in New York only to say afterward that he wasn’t specifically naming any one of his relievers as his closer. The Phillies have used three different relievers in save opportunities in the first three weeks of the season and if that sounds familiar, it’s because there is a precedent for this and for not really naming any one pitcher a closer, too. You have to go all the way back to … April of 2016 when a manager by the name of Pete Mackanin employed three guys (David Hernandez, Dalier Hinojosa, and Jeanmar Gomez) in the ninth inning for save situations in the season’s first week. He eventually settled on Gomez, never really made any big announcement, but Gomez kept getting outs in the ninth and so Mackanin kept running him out there. Expect the same with the current set-up and Neris. Even though Mackanin’s current go-to explanation is it’s “nice to have two guys (he) feels comfortable with in the ninth," it’s likely Neris keeps getting the ball as long as he keeps getting outs, and if he pitches three days in a row or something, than Joaquin Benoit gets an opportunity. The thinking here is Mackanin just doesn’t want to put the label on his young-ish reliever. Just keep taking the ball, Hector, rack up those strikeouts like you have in the 8th inning in the last year, and all is well. This seems to be a very popular opinion for people who either feel the Phillies need to have a long-term solution in the ninth inning for the next 4-5 years (they don’t) or for the folks who are tired of watching Vince Velasquez fail to go more than five innings in the majority of his starts. But there is no logical reason to demote the 24-year-old Velasquez from his role as a starter and stash him in the ‘pen after all of 27 starts in a Phillies uniform. • The closer role is often overrated (the Giants won three World Series with three different closers in a five-year span), but never more so than for a non-contending team. Remember what it was like having a highly-paid, All-Star veteran in Jonathan Papelbon as a closer just a couple of years ago? Superfluous. As a non-contending team, you can literally stick any pitcher in the ninth inning and see how it goes. Case in point: Jeanmar Gomez for the 2016 Phillies. The Phillies won’t need a lockdown closer until they’re ready to compete for a postseason berth (it could very well be the last piece of the puzzle they add, a la Brad Lidge in November of 2007), and they certainly don’t need to waste the next two seasons putting a pitcher with the potential of Velasquez into a one-inning role. • Speaking of which, let’s try some simple math. What’s more important, a pitcher who carries a 70-inning workload over the course of a 162-game season, or a pitcher that can give you 175-200 innings over that same 162-game season? As long as the pitcher isn’t a complete train wreck (which would eliminate him from being a possible closer option anyway), the answer is obvious. You remember Brett Myers, right? He did a fine job in 2007 in the ninth inning, but when it was all said and done, the Phillies knew he had more value to them in a starting role. • So you respond to the last note by saying Vince Velasquez will never pitch 175-200 innings in a season, right? Well, let’s slow down a bit. Velasquez is 24-years-old, he’s made all of 27 starts in a Phillies uniform, and he only just crossed the 200-inning total for his career on Wednesday in New York. He’s a kid who is allowed to learn how to pitch on a big league mound, who should be given ample time to harness his talent and grow, especially when he is suiting up for a rebuilding team that’s goal is to watch such players sink or swim in the next two seasons. • Still not sold? Still bothered that Velasquez has averaged just 5.41 innings per start in a Phillies uniform? Here are three pitchers who endured their own variation of struggles early in their career. Pitcher A is Vince Velasquez. Pitcher B is Cliff Lee. Pitcher C is Roy Halladay. Yes, Halladay was demoted to Class A Dunedin as a 23-year-old after sporting an 11.13 ERA in 13 starts in 2000, but Toronto didn’t give up on him as a starter and demote him to a one-inning role because they knew the talent he had in his arm and the potential value it could give them as a starter once he blossomed into a mature major-league pitcher. It must be a slow time of the year for talk radio show hosts and columnists (although maybe I should credit them for finding a topic that isn’t the NFL Draft, which dominates sports conversation for four months) when they’re already throwing out the thought of the Phillies trading for Mike Trout as a legitimate, doable idea for Matt Klentak and Co. These same folks conveniently leave out a couple of points. • If Mike Trout were available in a trade, 28 other teams would also be interested in trading for the best player in baseball, too. Some of those teams (the Cubs, Yankees, and Braves come to mind) have more can't-miss-type young talent to offer than the Phillies. And you can put six of the Phillies best young players/prospects together and, guess what, it’ll never be enough. Go look at all of the prospects the Phillies traded to get the likes of Roy Halladay, Brad Lidge, Cliff Lee, Roy Oswalt, and Hunter Pence. Take the five or six best, the ones that turned into productive major league players (or even major league players, period): J.A. Happ, Carlos Carrasco, Jonathan Villar, Michael Bourn, Travis d’Arnaud, Domingo Santana. Would anyone take that for the best player in the game? In a word, no. Not all prospects pan out (most do not) and no collection of prospects (even if you throw in a couple of young big leaguers like Odubel Herrera or Vince Velasquez) is going to sweeten any pot enough. • The Angels are not trading Mike Trout. Trout is 25-years-old and under contract for three more years after 2017. Even if the Angels are terrible this season, they have time to build around Trout for the next three years. Even if their farm system is poor, they are a big market team. If and when they determine they can’t win with Trout, it’s not going to happen until he’s at least within a year of free agency. Even if the Angels are a .500 team that may or may not contend, Trout has more value to them than he does as a trade chip and as a player on track to be one of the greatest to ever play the game. The only way you’d pry him away, in say, 2019 or so, is if the Angels don’t believe they’ll re-sign him before the winter of 2020-21 and you’re a team that just so happens to have another superstar to offer as trade bait. So, yeah he’s from South Jersey and he’s an Eagles fan. And he was outside of Citizens Bank Park when the Phillies clinched their 2008 World Series. And Klentak used to work for the Angels! Sorry, that’s nowhere near enough to waste any space writing an impractical and irrational story. J.P. Crawford is exactly 100 days removed from his 22nd birthday. J.P Crawford has collected six walks in his last five games (19 plate appearances). But J.P. Crawford is hitting .098 after 12 games this season and therefore he is not a good hitter nor will he ever be a good hitter. OK, I understand I’ve wasted far too many words in this space addressing topics that could very well be coming from a vocal minority, but the fact that some of these are out there at all is a little crazy. And yes, they’re out there. Here’s one. @ryanlawrence21 @thephillyvoice think it's time we stop ranking Crawford. He can't hit and has never showed he can hit. Look, I understand J.P. Crawford has slashed .228/.317/.300 in 99 games at Triple-A. This isn’t very good, and it’s a nearly-100-game sample size. But he’s young and no one ever said J.P. Crawford was the next Alex Rodriguez, Derek Jeter, or even Francisco Lindor. Sure, many people still believe he’ll be a very good major league hitter one day. But that day isn’t tomorrow, and as with Velasquez, the Phillies have no need to rush the issue, they can let Crawford continue to play (the entirety of?) the 2017 season at Triple-A and see how his bat adjusts in the coming months. The minor league season began exactly two weeks ago. Player A is J.P. Crawford. Player B is Jimmy Rollins. So if you really think J.P. Crawford isn’t a hitter and will never be a hitter, maybe you should just relax a little and let the kid keep playing this year, OK?